ErtelAlsop’s dewatering filter presses are among the most efficient means of liquid solid separation through pressure filtration, either for solution filtration or sludge volume reduction. A filter press provides a simple reliable method of high compaction pressure to compress and dewater solids into filter cakes of 25-60% total concentration. 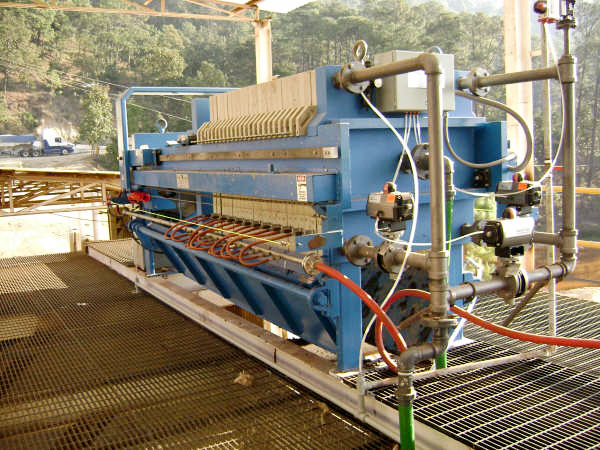 This provides clearer filtrate solutions than other filter press systems that only remove free water. The EA Series of heavy duty recessed chamber filter presses, and our membrane squeeze filter presses, are available in 100 PSI or 225 PSI design rating, and for solids handling ranging from 1 ft³, all the way to 350 ft³. Thirty-two (32mm) millimeter gasketed polypropylene filter plates are standard on all models, making these heavy-duty filter presses well suited for applications, which require leak-free processing. Other standard features include a chemically resistant painted steel skeleton, 304 stainless steel bar wear strips, schedule 80 PVC head connections, four corner discharge, hydraulic closure system, and a full 6 year framework warranty. As with all ErtelAlsop presses, filter cloth is available for any application and/or operating condition, and is chosen based on your specific operating conditions, the performance required by the filtering cltoh, and criteria given to us by you and/or by sample processing we do in our lab. ErtelAlsop offers the widest varieties of filter cloth and construction techniques to provide good particle retention, clear filtrate, high flow rates, and dry filter cakes.